Can't drive a motorcycle but still want the same experience? Then book a personal guide/driver! Highly recommended. Everything is great and in good condition, very reliable. The phone holder is a bit small if you are using a 6 inch plus phone, also the phone will get burning hot using it. If there are 2 riders just make sure to ask for an extra raincoat, they might just have one ready for you. Final tip, if there are any extra payment you need to pay to them make sure paying it during the delivery, not the return. They might ask you to drop everything to the reception but sometimes dropping money to a 3rd party might not be safe. It's not fun losing your security deposit just for a small payment missing. Discover the wonders of Bali like a local, without having to figure out how to get from point A to point B, by renting a motorcycle or a scooter during your visit to the island. 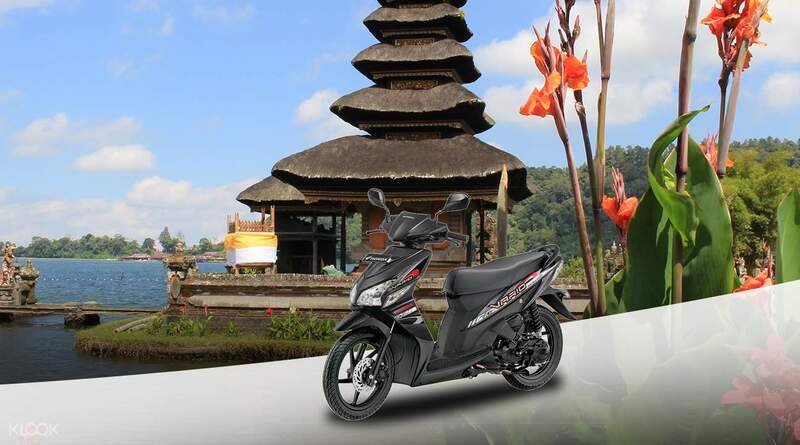 Choose from seven different models, with both manual and automatic transmission included, such as the Honda Scoopy, Yamaha Mio Sporty/Fino, Kawasaki Ninja 250, and more, depending on what suits your travel needs best. Each rental comes with two helmets at most, as well as a rain coat, so you definitely won't need to bring your own. Simply select your preferred model on the Klook website/app, enter the preferred number of rental days + all the required information at checkout, and you're good to go. Once you pay the safety depostit and finally have your motorcycle, you'll be free to explore the streets of Bali at your own pace, following your own itinerary and weaving through the traffic. Convenient delivery and pick up services available to the following areas: Airport area, Kuta, Legian, and Seminyak, free of charge! We got a nice new bike. We booked for 3days. The bike was really comfortable and fuel save for a long trip. The staff was also really helpful, the pickup and return service was really convenient. We can return our bike at the airport easily. We got a nice new bike. We booked for 3days. The bike was really comfortable and fuel save for a long trip. The staff was also really helpful, the pickup and return service was really convenient. We can return our bike at the airport easily. Scooting around Bali is the best way to travel! My scooter was delivered to me and the staff from Kuta Scooter Rental was very helpful, quick to respond, and like everyone I met in Bali, very Hospitable. Scooting around Bali is the best way to travel! My scooter was delivered to me and the staff from Kuta Scooter Rental was very helpful, quick to respond, and like everyone I met in Bali, very Hospitable. Transaction was smooth. Bike was in good condition except for one of the mirror which doesn’t stay in place. Phone holder wasn’t really useful. Phone doesn’t stay in place unless held by rubber band. Transaction was smooth. Bike was in good condition except for one of the mirror which doesn’t stay in place. Phone holder wasn’t really useful. Phone doesn’t stay in place unless held by rubber band. Remember to check email a day before collection to confirm else they will cancel the delivery. Easy to collect, bike in good condition, helmet is okay but only 1 raincoat. They will contact you by whatsapp once reached. Remember to check email a day before collection to confirm else they will cancel the delivery. Easy to collect, bike in good condition, helmet is okay but only 1 raincoat. They will contact you by whatsapp once reached. The side mirror was a bit loose we had to stop by at the nearest workshop to get it done as we had a long way to go around Bali. Helmet visor need to be replaced. Visibility was poor because of the scratches & even worse during rain. Please bring along safety glasses or goggles when riding as it will helps greatly. The other helmet came without visor fyi. Handphone holder need to be changed instead of putting elastic bands around it to secure the handphone. Overall the bike was ok for me. The side mirror was a bit loose we had to stop by at the nearest workshop to get it done as we had a long way to go around Bali. Helmet visor need to be replaced. Visibility was poor because of the scratches & even worse during rain. Please bring along safety glasses or goggles when riding as it will helps greatly. The other helmet came without visor fyi. Handphone holder need to be changed instead of putting elastic bands around it to secure the handphone. Overall the bike was ok for me. using the bike to get all the way through Bali, roughly about 200 km, from uluwatu to legian, tanah lot, wanagiri, banghli, pura ulun, pura lempuyang, tegallalang, kintamani, sanur and so on. the motorbike pike up is on time, and the staff is very friendly. highly recommended. using the bike to get all the way through Bali, roughly about 200 km, from uluwatu to legian, tanah lot, wanagiri, banghli, pura ulun, pura lempuyang, tegallalang, kintamani, sanur and so on. the motorbike pike up is on time, and the staff is very friendly. highly recommended. I got a Whatsapp ping from him some hours back. Vendor representative was waiting for us outside the Airport. He took us to the Scooter parking area and handed over the key and Scooter. The scooter was filled with full tank petrol along with 2 helmets, 1 rain coat, and the Registration papers. It was Honda Scoopy we ordered, really good choice. We covered almost 250km in 5 days of Bali trip..!! Scooter is the best option to roam around in Bali. Last day gave the bike back to vendor with full tank petrol. He was available just outside the parking area of Airport at the agreed time. I got a Whatsapp ping from him some hours back. Vendor representative was waiting for us outside the Airport. He took us to the Scooter parking area and handed over the key and Scooter. The scooter was filled with full tank petrol along with 2 helmets, 1 rain coat, and the Registration papers. It was Honda Scoopy we ordered, really good choice. We covered almost 250km in 5 days of Bali trip..!! Scooter is the best option to roam around in Bali. Last day gave the bike back to vendor with full tank petrol. He was available just outside the parking area of Airport at the agreed time. This deal from Klook is amazing. We rented a Scoopy. They sent us an email shortly after, asking for my Whatsapp number to ensure easy communication. Scooter delivered on time to our hotel, full tank. Scooter easy to use (can be quite challenging at times because of Bali's traffic). They were polite and accomodative when I asked to change the return time. Recommended. This deal from Klook is amazing. We rented a Scoopy. They sent us an email shortly after, asking for my Whatsapp number to ensure easy communication. Scooter delivered on time to our hotel, full tank. Scooter easy to use (can be quite challenging at times because of Bali's traffic). They were polite and accomodative when I asked to change the return time. Recommended. It was great experience to book scooter over Klook. It was hassle free experience. They delivered and picked up just on time. I highly recommend delivery guy Puttu for his professional and helpful behavior. They provided extra helmet and raincoats. He even delivered bike in non serviceable area with very little charge. I recommend this service to anyone visiting Bali. It was great experience to book scooter over Klook. It was hassle free experience. They delivered and picked up just on time. I highly recommend delivery guy Puttu for his professional and helpful behavior. They provided extra helmet and raincoats. He even delivered bike in non serviceable area with very little charge. I recommend this service to anyone visiting Bali. Scooter was in good condition. The whole process of bike handover were hassle free. Good call to take bike on klook. Scooter was in good condition. The whole process of bike handover were hassle free. Good call to take bike on klook.